There are certain things we as 21st century people need to take stock of life. If it was moving pretty fast for Ferris Bueller, then we’re lapping him before he hits a quarter-mile. It is comfort that sustains our modern lives from becoming severe or breaking us down. You may be thinking of your go-to comforts now: an invigorating hike at dawn? A particular pair of sweatpants? Batman: The Animated Series? They’re all fine, and they are removed from judgement because these are items or ideas that take you back to center, that slap a smile on your face and reminds you that things will be just fine. Games about oriental military conquests with faint historical accuracy where you can choose dozens of over-the-top warriors to magic-murder the hell out of thousands of soldiers and officers, while only hitting a two to three different buttons during hours of gameplay? Folks, well, that’s my comfort. 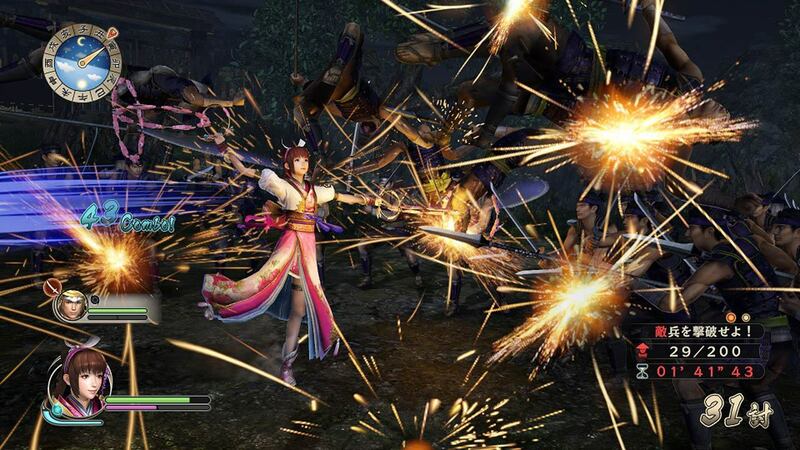 Samurai Warriors: Spirit of Sanada is the latest for the franchise from developer Omega Force and Koei Tecmo, and the latest iteration in their long lineage of hack n’ slash games like Dynasty Warriors. 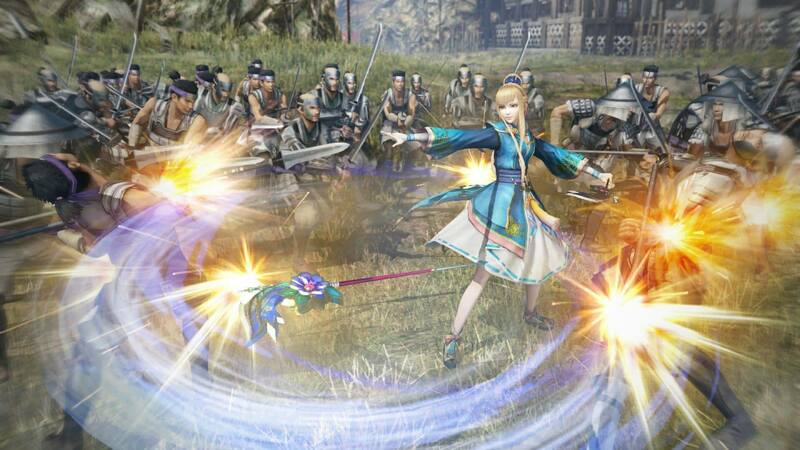 With Samurai Warriors and Dynasty Warriors being their more mainstay franchises, they have found success in off-shoots that are hit-or-miss in Hyrule Warriors or BERSERK, and others. And if you have played any of these games, you may have an idea of what you are getting into: large scale battles, people with spears, breaking stacks of hay for rice balls, building Musou meters, and murdering the holy hell out of everyone in your path. By now it may be a little hard to differentiate between what makes anything memorable between each game; the stage pieces aren’t exactly astounding (or there in some cases) and gameplay innovation is not something to be expected. 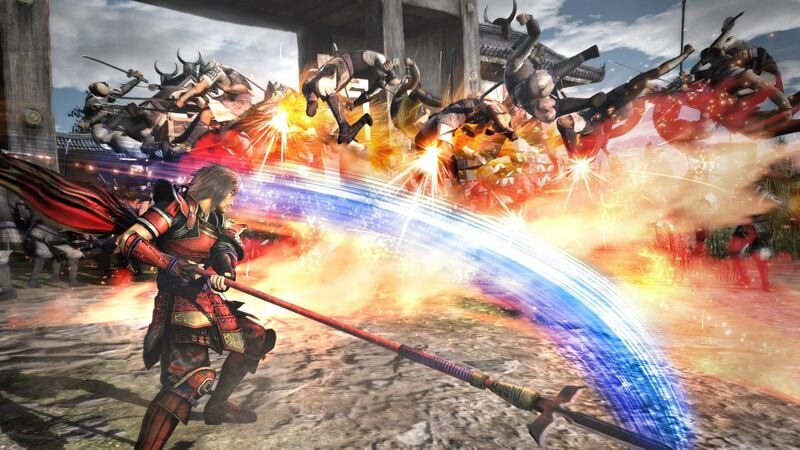 When Samurai Warriors and Omega Force are at their best, you are some real-life figure wielding a larger than life weapon, cutting swaths of nameless and the occasionally named enemy. It’s simple and it is effective; the ultimate power trip. This is not the game to be the character born of circumstance struggling from happening to happening, you get in and there is nothing but blissfully exercising the Square and Triangle buttons. The newest game is about the Sanada Clan, led by main protagonist Sanada Masayuki (also Masayuki Sanada) during several 16th Century Feudal Japanese conflicts. From the onset, you get introduced and thoroughly attached to Masayuki, learning the basics of the game through his character, and the game remains centralized around him for quite a bit of time after this. While these games often have multiple campaigns ready at the head, with at least a character or two to pick from, Spirit of Sanada dedicates itself to the Clan. This presents an unusual amount of character development that these games seemingly write-off–particularly when they aren’t borrowing from another IP (i.e., Hyrule Warriors). You get to learn a few character’s and their relationships, especially Masayuki with his two sons and daughter, whose heavier inclusion in the latter half of the game doesn’t make such an abrupt appearance. To see some sort of effort is refreshing, but in reality it is completely unnecessary, at least to me. About mid-way through, there was only so many debates over battle strategy that I could read without hitting the auto-play button and then picking up my phone to surf Reddit or something. If you are looking for a deep-dive into the history behind the clans and the battles, you’re better off firing up Britannica or grabbing a few books because these will be the most bare-bones explanations of Japanese conflicts. As a History major (and buff), it neither gives you enough to make it interesting and worth while to sit through, and it is not stripped to toddler-simplicity to breeze through–it’s a poor middle ground. And there are a lot of cut-scenes you can sit through, which if you want to skip that is perfectly okay, you can unlock a Vault feature where you can watch all the cut-scenes over. What shines in Spirit of Sanada is the gameplay, it is absolutely a blast. The stages are more or less cookie cut, with you mountainous vista or forest area, day or night, raining or whatever. I didn’t walk into each battle expecting to be awed by scenery, instead they offer ways to break up strategy that isn’t just kill everything as fast as possible. Particularly in later areas you’ll have to establish choke points with your “partner” character that you can both command and take over instantly if you wish. 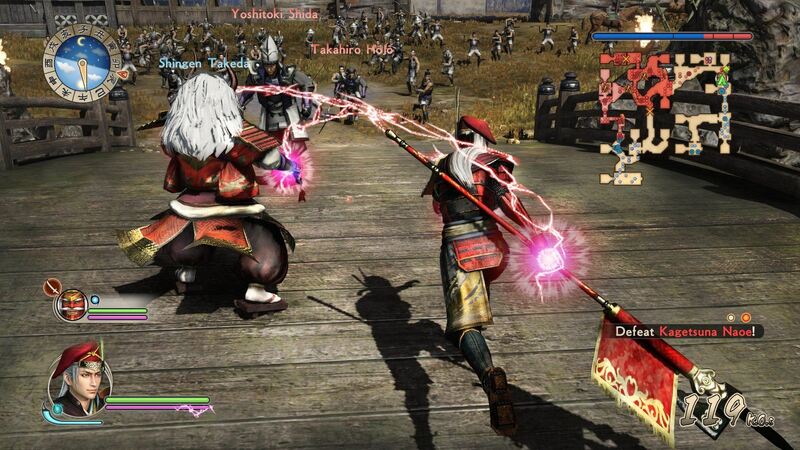 Attacks are varied depending on each character’s weapon, but you have your typical square-combos, triangle-combos, and square-triangle combos, all building until you can unleash those sweet and deadly Musou attacks. Your building rage meter makes your attacks deadlier and slows down all enemies around you until you release a second more powerful Musou. Combat feels familiar but still great and still satisfying. I found myself stringing together Frankenstein combos that left me smiling because “who knew” that could even happen. Griping with the linear aspects of the first half or so of the game is that Masayuki ends up being a god among men, and then you’ll toss him and any kind of experience you’ve built with him to the wind and have these low-leveled characters thrown into your service. It may be fun to have a couple curve balls in there–and they have it built into the main story, where you’ll fight battles not among the Sanada timeline, but still occurring at the same time. These are the instances of testing out new characters, instead of being forced to lose the one character you’ve been using until that point. Now this transition doesn’t make things impossible, just a little bit annoying. I liked being a uber-warrior that swung like Sauron and walked through the battlefield like this impenetrable god-fiend. More personal notes are present in this game, coming from the home bases found throughout the game–the home bases. You can upgrade weapons and officers, purchase medicines, go fishing, speak to townspeople and get some small side-quests that will provide small boosts to your Strategem uses (essentially battle events that can change the flow or stop the enemy at points or whatever pertains to that particular battle). There are also “exploration areas” that let you complete some smaller quests, but are essentially new areas that are to best serve as gathering resources for free. You eventually will make so much money that you won’t bother to go back and find those items (you do have to get them at least once). Your castle towns will grow into huge areas as you progress as well, a simple inclusion that lets you know that you are both progressing through the story and having a quick visual cue to know that you are succeeding. Watching the base grow is one of my personal favorite small things in games that I love to see, it is completely unnecessary in most aspects and most games but having a bigger thing to run around or that looks prettier is always a fantastic touch. Coming back to the visuals, the game is perfectly representative of the power of a Playstation 3. Environmental textures are ugly, enemy or characters that are not playable are carbon copies – and bad ones at that, it isn’t a wonderfully pretty game. Worse, the frame-rate should be a rock solid 60 frames per second but is instead 30 at its best, dipping far below that when there are tons of enemies on screen getting murdered by a bevy of your attacks. Spirit of Sanada may be a sign of the shifting tides with Omega Force’s ability to tell a story. Yes, it is linear, and it isn’t going to have the emotional resonance of The Last of Us, but simply for the effort of trying to give you an actual story is commendable to its creators. For you to feel any kind of emotion after literally killing hundreds of thousands of enemies without blinking, is pretty fantastic. The last third becomes genuinely engaging–as I have mentioned I had been auto-playing most cut scenes while pretty much dicking around in-between battles, which is more than I would have ever expected or would have ever asked for. What I wanted was the 2,000 K.O.s and 10,000 hit combos – easy asks. People are going to look at Samurai Warriors: Spirit of Sanada and know exactly what their getting when they pluck it off the shelves or add it to their cart. You’ll have the camp that will gravitate to it immediately or you’ll have the people that will laugh that they made another and move on. It is telling though that they keep “making another,” because these games are consistently good. Being good is not being broken beyond completion, not having a new headline grabbing idea every year that doesn’t end up panning out; the games are just fun. 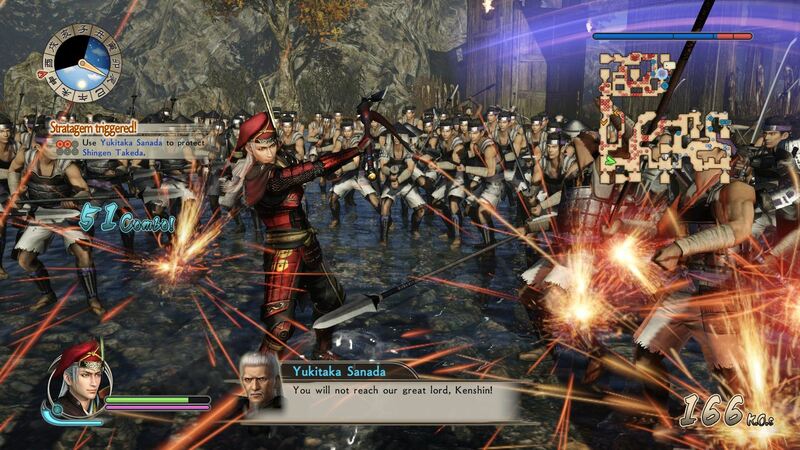 Spirit of Sanada is more than you could bargain for in a hack n’ slash, certainly a tier above the offerings from Dynasty Warriors and more in line with the joyful-surprise that was Hyrule Warriors. This isn’t The Witcher or Breath of the Wild, taking the franchise for what it is will already put you in the mindset you need before diving into the Sanada chronicles, but what it is, is a great example – if not the best – of the franchise and the genre as a whole. This review based on a retail copy of the game provided by the publisher.